Orson Welles was Cary Joji Fukunaga’s first Mr. Rochester: a brusque and brooding rich man holed up in his great stone castle, falling in love with a humble governess and trying mightily to ignore the madwoman he’s stashed in the tower. The fog-enshrouded 1944 film adaptation of Charlotte Brontë’s classic Gothic romance, “Jane Eyre,’’ starring Welles opposite Joan Fontaine, had been one of Fukunaga’s favorite movies when he was a child. But it didn’t occur to him to check whether there were other versions until he had already signed on to make one of his own. For such a prim and sheltered little creature, Jane is indeed far worldlier than one might suspect. The Internet Movie Database lists 22 film and television adaptations, stretching back to 1910. When the first talkie came out, in 1934, it followed a half-dozen silent versions. Broadway, too, has had a couple of fleeting crushes on Jane. She has even inspired operas. “You would hope that people would embrace different interpretations, and that’s what the arts are for, anyway,’’ Wasikowska (pronounced vah-she-KAHV-ska) said, her speech tinged with a soft Australian accent. Wearing a gray sweater over a dress whose iridescent Peter Pan collar gave her the air of a sprite, she sat cross-legged on the couch of a sunny hotel suite on Charles Street. Fukunaga, who made his feature-film directing debut with the 2009 thriller “Sin Nombre,’’ was sprawled in a neighboring chair. The book opens on the orphaned Jane as an inquisitive, spirited, and plain-looking 10-year-old, loathed and mistreated by her cruel and wealthy relatives. Banished by her aunt from stately Gateshead Hall, she spends the rest of her childhood at Lowood Institution, a charity boarding school overseen by the wicked, self-righteous Mr. Brocklehurst. At 18, she leaves to become governess to Mr. Rochester’s young ward at Thornfield Hall. Delighting in her employer’s intellectual companionship, she is taken with him despite his physical unattractiveness. When someone sets Mr. Rochester’s bed aflame one night, and when a houseguest sustains a gaping flesh wound mysteriously inflicted by human teeth, Jane is unsettled but unswayed: Mr. Rochester has won her heart, and she his. How is she to know that he has a mentally ill wife, Bertha, hidden away in an upper room? Their wedding stopped at the altar by that revelation, Jane flees Thornfield and wanders the moors until, near death, she is saved by a handsome clergyman named St. John Rivers. St. John asks her to marry him, but the cold-blooded missionary is no match for the romantic Mr. Rochester, who is now free to marry her, since Bertha has burned down the house and perished. Just as that synopsis necessarily leaves out myriad details dear to Brontë aficionados, the novel’s film, TV, and stage adapters tend to jettison whole story lines and numerous characters (often the kind ones, like Lowood’s saintly superintendent, Miss Temple) while adding elements Brontë never dreamed of, partly because that’s what the constraints of each form demand and partly because they’re storytellers, too. They’re not replicating Brontë’s book; they’re making it into something new. Take Mr. Rochester’s castle from the 1944 movie, and the tower where Bertha lives: They’re Hollywood inventions. Brontë calls Thornfield a three-story, battlement-topped mansion “of proportions not vast, though considerable; a gentleman’s manor-house, not a nobleman’s seat.’’ But in cinematic tradition, it’s almost always an enormous, medieval stone pile. Similarly, “Jane Eyre’’ on stage and screen tends to have principals significantly better looking than the homely specimens Brontë describes. For evidence of this, one need look no further than the 1983 TV miniseries, with a pre-Bond Timothy Dalton as Mr. Rochester. In the 1934 movie, starring Virginia Bruce and Colin Clive, Jane is an unabashedly glamorous and effervescent blonde, even as a child. Made during the Depression, that version runs a scant 62 minutes. Nonetheless, it manages to introduce a whole new major character, a Thornfield servant named Sam Poole, whose necessity to the plot becomes clear at the end. Jane, in exile from Thornfield, is serving dinner to the poor at a mission when Sam, now unemployed, comes through the soup line and tells her of the fire. Evolving social attitudes influence interpretations, too. In the book, Jane expresses sympathy for Bertha because her insanity is no fault of her own. 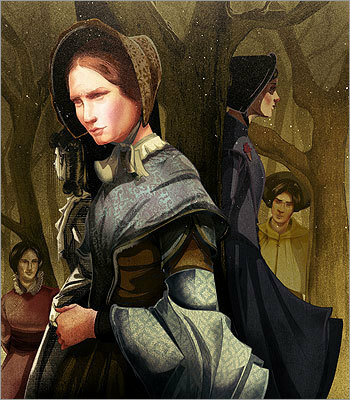 But versions of “Jane Eyre’’ in other media make Bertha more human than Brontë did. She is often beautiful, and she is palpably in anguish. A stage version by the British theater company Shared Experience, which had its US premiere in 2000, exemplifies this: Once Jane arrives at Thornfield, Bertha is onstage throughout, her suffering unremitting and almost always unseen by the other characters. Not even Blanche Ingram, the socially prominent but money-grubbing belle who Jane fears will marry Mr. Rochester, is universally scorned by adapters. The 2006 “Masterpiece Theatre’’ version dares to make her fairly sympathetic, the product of a vain and shallow mother and the victim of a man who is using her in order to inflame the jealousy of the woman he really loves. But do adapters want their Jane to be united with long-lost relatives on the way to her happy ending? Frequently, that’s a strand of the story that falls away. The 2000 Broadway musical went so far as to have Jane inherit a colossal fortune not from an uncle she didn’t know she had but from the aunt who despised her — the one who, in Brontë’s telling, is nearly broke by the time she dies. However faithful an adaptation — and the “Jane Eyre’’ award for fidelity surely would go to the BBC’s 1973 miniseries starring Sorcha Cusack and Michael Jayston, which makes its way through Brontë’s novel with near-religious devotion — it still can’t reproduce what’s in a reader’s head. Wasikowska, now with a pair of classic literary characters under her belt, likened the multitudinous reworkings of “Jane Eyre’’ to artists’ reinterpretations of the Mona Lisa, or playwrights’ dissimilar takes on the same subject in different eras. Laura Collins-Hughes can be reached at lcollins-hughes@globe.com. Correction: Because of an editing error, an incorrect date was given in an earlier version of this story for Franco Zeffirelli's film version of "Jane Eyre." The correct date is 1996.